ATLAS ELEKTRONIK UK Ltd, based in Winfrith, Dorset is a leading provider of science and technology solutions to the UK Ministry of Defence, the Royal Navy and to other defence departments and corporate customers internationally. We offer complete solutions, from research through product concept, design and development, manufacture and subsequent support. The business has been at the forefront of UK naval research and development for over sixty years having its roots in the Admiralty Underwater Weapons Establishment (AUWE) Portland. The company became part of the global ATLAS ELEKTRONIK Group in October 2009 and is the Group’s largest subsidiary. Within the Dorset area we are one of the largest employers of scientific and technical staff with a workforce of over 380 employees, many of whom hold post degree qualifications and are members of professional institutes. Within the Company we pride ourselves on our innovation and world leading technology, having teams of highly skilled engineers and scientists in a dedicated engineering department ensuring our products are designed and built to the highest of standards. Highly professional support teams provide the infrastructure of a friendly and efficient company. Our customers have access to the largest and most diverse concentration of underwater warfare expertise in the UK. Our products and services cover all aspects of underwater technology and systems and are sold both in the UK and around the world. 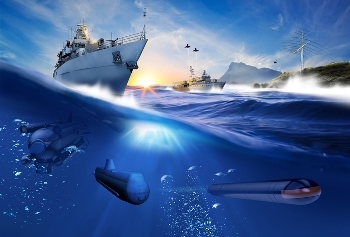 Sonar systems, underwater communications, mine countermeasures and unmanned vehicles are just a few of our capabilities. In the past three years we have grown the turnover of our business by over 40% and our percentage of exports has grown significantly. As a result we have been able to expand our internal R&D programme, which has resulted in a number of our concept technology demonstrators being brought to full product maturity. Our growth has enabled us to create a significant number of new, highly skilled jobs in our locality. We have also invested in new machinery and laboratories which have allowed us to mature our manufacturing capabilities. We have, however, not forgotten that our priority is to serve our home market and primary customer, the UK MOD. We have retained sovereign capability for this purpose and the majority of our work is still in support of UK programmes. We are particularly proud of our dedicated and talented engineers and scientists who create innovative solutions to difficult problems. The Royal Navy has and will continue to benefit from the new technologies that we create. ATLAS ELEKTRONIK UK is 100% owned by ATLAS ELEKTRONIK GmbH, a ThyssenKrupp company.